The mySidewalk Home Page features a fast, intuitive, and clutter-free navigational experience. This navigation pane will direct you to the primary features of mySidewalk and will always be visible while navigating between tools. 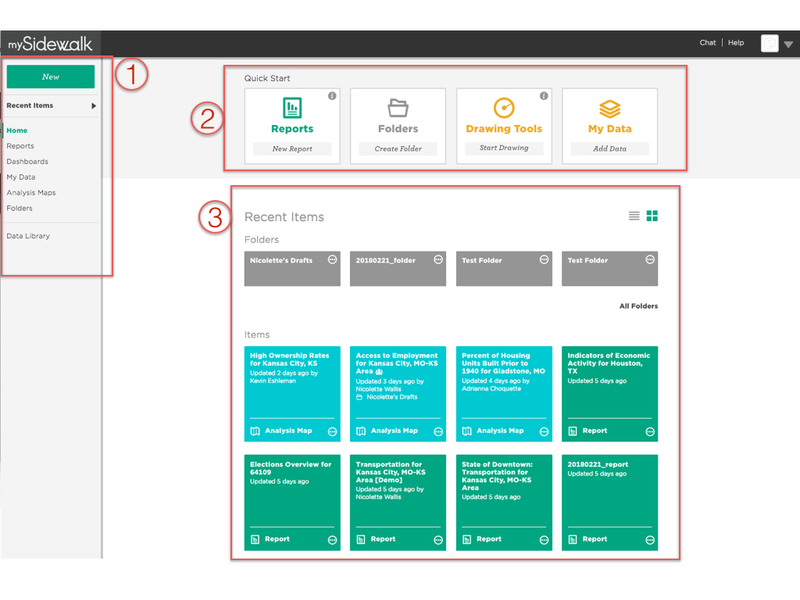 New allows you to to create a new report, folder, or add data directly from the navigation pane. Recent Items highlights your recent folders, reports, maps, and dashboards. Home takes you back to the home page. Organization and setup for your organization can be found under Folders. This is where you can create and organize both individual and collaborative project folders. The Data Library will be your main resource for identifying and/or researching any data sources provided by mySidewalk. Unique geographies and data that are important to you can be uploaded in My Data. Once your data is uploaded, you’ll be able to enrich it with mySidewalk data and/or geographies. Finally as you move to action within your organization, the areas where you’ll find the most insight are our Analysis Maps, Reports, and Dashboard experiences. The Quick Start menu allows you to create a new report, request a dashboard, or add new user data in one click. Below the Quick Start you’ll find your Recent Folders and Recent Items. These allow you to jump right back where you left off quickly and easily. Recent Folders makes your most recent project folders available with a single click. Clicking on the folder will open the folder so you can access the items in that folder. Recent Items shows reports, maps, and dashboards that have been modified in the past 30 days. Each item is labeled by name, when it was last updated, and what kind of item it is (report, map, or dashboard). To open the item, click on the item name.